Inspired by our local farmers, the menus at Solarium spotlight the best northwest ingredients executed with simple, fresh craft cooking. Solarium, meaning 'a room fitted with extensive areas of glass to admit sunlight', provides a welcoming atmosphere to gather together and enjoy the best in northwest cooking. Enjoy craft cocktails and an extensive list of local bear and wine as you dine. Serving breakfast, lunch, dinner and Sunday brunch. 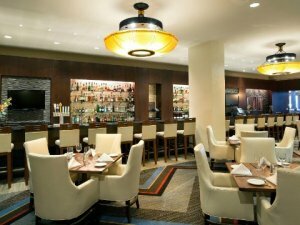 Solarium Bar, located in the main lobby, is the perfect gathering place, featuring a selection of premium craft beer on tap and specialty northwest wine along with tempting appetizer and dinner specials. Enjoy conversation and view the news or your favorite sporting event on our two 42" flat panel high definition televisions.